If it is not quite obvious by now, then I'll say it again: I like when artists, designers and major corporations make products out of recycled materials. I love it when they do it well. That was the first and foremost thing I noticed about the Sahabo books when I first met Sande Edwards~ how well designed and made her books are. The idea behind the album books is awesome (records into books) and she does it so very well. It is clear to anyone that there was a lot of time and thought put into them, and the result is one great product. 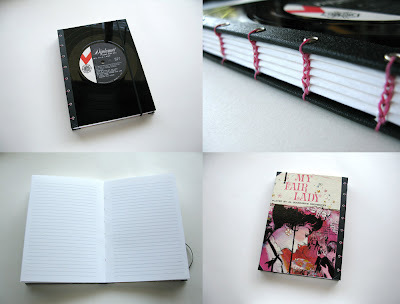 I also love that Sande has taken her designer's mind and eye to book making and has come up with very inventive pieces, such as the Polaroid photo album. 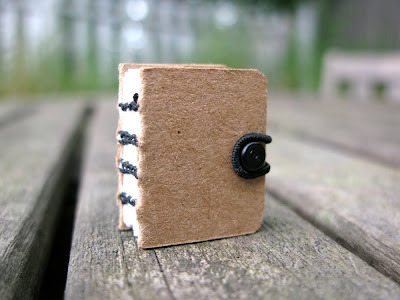 And, the mini books? My heart swoons! A~My books began out of curiosity. I had a class assignment in college that required us to bind the information we were gathering into book form. We could choose how we bound it, whether professionally or by hand, so I starting researching all manner of book binding. I found the Coptic Stitch by accident but found that I couldn't use the technique for that particular project. I really wanted to learn the technique so once classes were out I started teaching myself the coptic stitch over the summer of 2010. 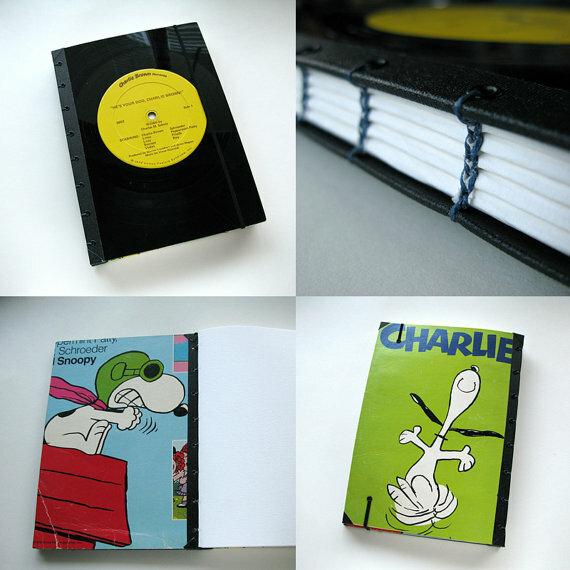 A~I would say the vinyl records are by far the best material I have used to make books. I want to eventually use wooden boards, plexi glass, and grass/woven materials. A~I find the process very cathartic. After classes or work, it is the best method for me to release any pent up stress I may have accrued during the day. A~ Each book represent how I may feel at the time. 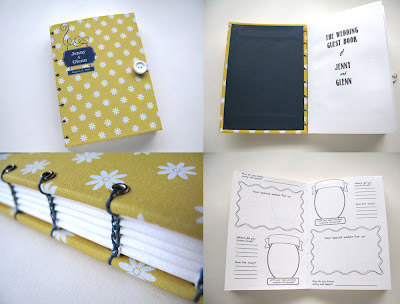 I could be moody and create a rain journal or really happy and excited and make a bright and pretty journal with buttons. It really comes down to my mood at the time. A~I love to create and always have. I am just so glad I have happened upon a skill that really helps be express my artist abilities. A~ I just started doing craft shows at the end of last year, right before Christmas. One was really great and had my head dizzy with excitement but the second one was completely disappointing without a single sale. So when I went into 2011's craft season I had several shows on my calendar and a lot of doubts on my mind. I'm still in learning mode when it comes to working with the public and trying to sell myself and my goods to them. I started on Etsy like so many others trying to sell their handmade items and have been fairly successful but I have also created a website tailored specifically to the books, the process, and myself and to separate my product form the others. A~ I love coming home from my day job and sitting down to create a very special gift for someone out there in the world. 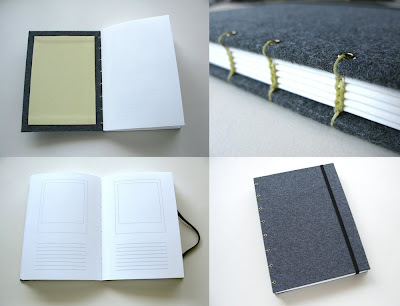 If it's not a custom order I get to imagine any kind of person and design a book around that, giving the book a personality of its own. A~ There's a saying I often hear in a variety of situations: When it rains it pours! I can go over a week without a single order and really need the money to buy some sort of supply item. Then, all of the sudden, I will get 10 custom orders in at once and then have a show the next day and still have to work my regular job! I love the business but hate the stress! A~ Of course I would love to one day make a living from making and selling books and book arts. To get up each morning and eat, breathe, and taste book making would be ideal. A~ Well, completely unrelated to any of this but I've always wanted to fly! I have dreams of flying but it's actually more like swimming in the air haha. A~ I am currently in South Arlington in Northern Virginia. But originally my longtime boyfriend and I are from Atlanta GA.
A~ I really want to move to San Francisco CA. Though I've never been, in my mind it is the quintessential location based on weather and people personality. 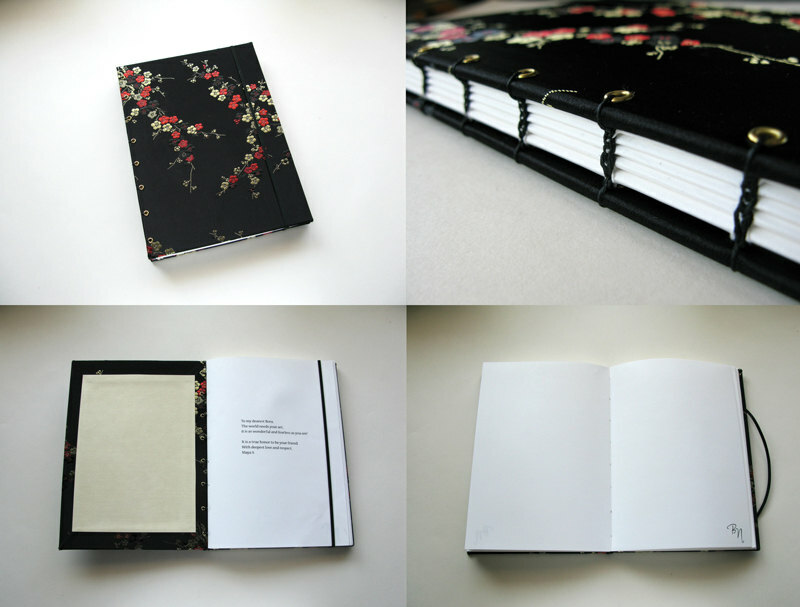 A~ During the day I am a graphic designer and I'm sure I would fill my time and my portfolio with freelance work. A~ I have no idea! A~ I wake up to a full glass and go to bed with a full belly after draining it. A~ What do you do? People love to talk about themselves and it makes it that much easier in social situations to learn about people and make friends! Q~ What is the airspeed velocity of an unladen swallow? Stay up-to-date with the Sahabo calendar! Green Tip~ Buy someone a Sahabo book as a gift! Sande has a whole list of albums that she can make into books. Start your holiday shopping for all those hard to please family members by ordering today! The brother in law that hates everything but loves Foreigner? Done! Grandma who has everything, but loves pictures of her pekingese? Done! Dad who is obsessed with My Fair Lady? Already made (see above). Don't delay, supplies limited* and artist overworked. *Titles, books and bad 80s bands are used for advertising and art frenzy inducing only and do not indicate the actual stock available for purchase. Void where prohibited by people who aren't cool.